For home business owners and freelancers, LinkedIn offers a tremendous opportunity to promote your business, network with influencers, and build your professional online presence. However, when you initially join LinkedIn, you're given a long, difficult to remember profile URL. This can be a problem when trying to share it with others you want to network with. 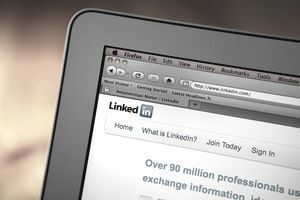 The solution is to create a custom URL for your LinkedIn Profile that can make it more recognizable and easier to use. There are several reasons to create a custom URL in LinkedIn. One is for search engine optimization (SEO). Search engines, including Google, use keywords within a URL to help it decide what web pages to deliver in search results. A URL of http://www.linkedin.com/in/freelancewriterohio would have a better chance of ranking well in Google for a search using the keywords "freelance writer Ohio" than would the first URL of http://www.linkedin.com/in/yourname/5/792/58a. Another reason to create a custom Linkedin URL is ease of use and recognition. Having a line of numbers at the end of a URL looks messy and difficult, and it's more likely to be ignored. Whereas, a URL with your or your business' name at the end will be clear what it's linking to. While LinkedIn URLs aren't as straightforward as they could be, the custom URL is still easier to remember than the default one. What are you branding? Do you want you or your business name to be the focus of your endeavor? How do you want to be known in the professional world? How easy is it to use? While combining your name and business allows you to use both, it also creates a long URL that can be difficult to use if people have to type it in (i.e. off of a business card). Will your name change? Traditionally, this is more of a problem for single women who get married and decide to take their husband's name. However, I've seen many couples hyphenate both their names, in which case, it impacts men, as well. In this case, using your business name might be better. You are allowed to change your LinkedIn customer URL up to five times in a 180-day period; however, this is not advised. First, changing your URL means you have to update it everywhere you used the old URL. Further, people with the old URL will have difficulty finding you. Finally, after 180 days, someone else can use your old URL, which could potentially lead your clients and customers to the other person instead of you. For this reason, pick a name you know you can live with for a long time. The instructions below work on your public profile. On the main menu bar at the top of the page, hover over Profile with your mouse and select Edit Profile. Hover your cursor over the current profile URL under your profile picture. The settings icon will appear next to the URL. Click it. On the right-hand side of the page, you'll see a section that says, Your Public Profile URL. Click on the edit icon next to it. In the edit box, type the custom name you'd like in your URL. You can have 5 to 30 letters or numbers, but no symbols or special characters (i.e. you can't use "*" or "!"). Your custom name is NOT case sensitive, so JoeSmith and joesmith will both work in the URL. When you're done, click Save. If your custom URL isn't already in use, you're all set. If it is in use, you'll need to submit a new custom URL. You can add your middle initial or your business name or type to create a unique URL. For example, if JoeSmith is taken, you can use, "JoeQSmith," "JoeSmithSellingWords," or "JoeSmithCopywriter." Be sure to update your new LinkedIn URL on your website, blog, and other marketing materials.